Standing on Mount Yamanlar (Dağı), the tomb of Tantalus is an example of the tholos type monumental tombs. The grave room of Tantalus’ tumulus was in the plan of the fountain, displaying a style called isopata, meaning the construction has a rectangle plan, covered by vaults made with a corbel technique. This monumental work is thought to be the tomb of the Basileus or Tyrant who ruled ancient Smyrna in 580-520 BC. One of the more pronounced elements of Izmir harbor is the Clock Tower, a beautiful marble tower that rests in the middle of the Konak district, standing 25 meters in height. It was designed by the Levantine French architect Raymond Charles Père in 1901 for the commemoration of the 25th anniversary of the ascension of Abdülhamid II. The clock workings themselves were given as a gift to the then Ottoman Empire by Kaiser Wilhelm II. The tower features four fountains which are placed around the base in a circular pattern, and the columns are inspired by North African themes. The Agora of Smyrna is well preserved, and is arranged into the Agora Open Air Museum of İzmir, although important parts buried under modern buildings, waiting to be brought to daylight. Serious consideration is also being given to uncovering the ancient theatre of Smyrna where St. Polycarp was martyred, buried under an urban zone on the slopes of Kadifekale. It was distinguishable until the 19th century, as evident by the sketchings done at the time. On top of the same hill soars an ancient castle which is one of the landmarks of İzmir. 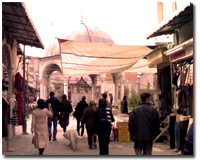 The Kemeraltı bazaar zone set up by the Ottomans, combined with the Agora, rests near the slopes of Kadifekale. İzmir has had three castles historically- Kadifekale (Pagos), the portuary Ok Kalesi (Neon Kastron, St. Peter), and Sancakkale, which remained vital to İzmir’s security for centuries. Sancakkale is situated in the present-day İnciraltı quarter between Balçova and Narlıdere districts, on the southern shore of the Gulf of İzmir. It is at a key point where the strait allows entry into the innermost tip of the Gulf at its narrowest, and due to shallow waters through a large part of this strait, ships have sailed close to the castle. The İzmir Birds Paradise in Çiğli, a bird sanctuary near Karşıyaka, contains 205 species of birds. There are 63 species of domestic birds, 54 species of summer migratory birds, 43 species of winter migratory birds, 30 species of transit birds. 56 species of birds have been breeding in the Park. İzmir Bird’s Paradise which covers 80 square kilometres was registered as “The protected area for water birds and for their breeding” by Ministry of Forestry in 1982.